Atlas Wire is a leading supplier of Automotive Wire. 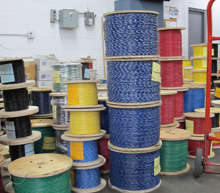 Our clients are pleased with the quality of Automotive Wire we provide and the ability to purchase in low quantities. They know we can custom-make wire for a specific purpose if needed. We provide our clients with a wide range of PVC Insulated and Cross-Llinked Polyolefin Insulated Automotive Wires. Our Cross-Linked Automotive Wire is rated to withstand 125c temperatures while our PVC Insulated Automotive Wires will withstand a 105c temperature. Our Cross-Linked Automotive Wire is moisture cured. Silane is the agent used to cross-link our insulation which has greater resistance to low temperatures, high temperatures, and impact when compared to PVC insulated wires. Atlas Wire has a wide variety of conductors available, including Solid, Bare Stranded, Tinned Solid, Tinned Stranded,Topcoat, Prebond and Overcoat. Atlas Wire is a premier supplier of all kinds of Automotive Wire. Contact us today by calling our Illinois Office at (847) 678-1210 or our Arizona Office at (520) 747-4500. You can also Send Us a Message to learn more about how we can meet your needs for Automotive Wire. Click on a product subcategory below to view our automotive wire selection.